This weekend my family is coming to Wilmington, traveling from places as far flung as Ireland and New Orleans, for a week of Thanksgiving fun. Three of my five siblings (and their families) will be in town, plus my parents, cousins, aunts, and uncles. We’ll be baking biscuits, roasting oysters, watching toddlers wrestle, playing football in the park (the “we” on that one is pretty loose), toasting to new engagements, and enjoying the experience and madness of being together. The pressure of helping to host Thanksgiving in a house where the paint is still drying (that’s only kind of a joke) has been a great motivator in getting things done. 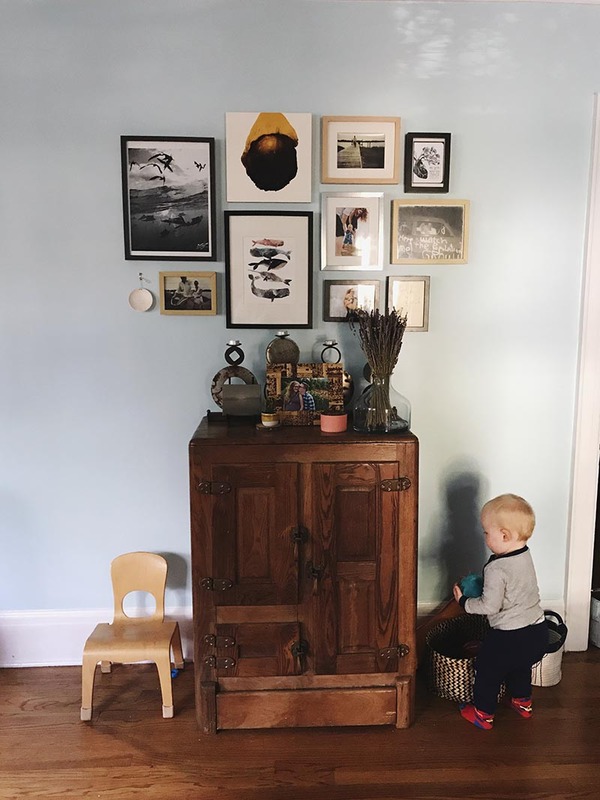 This week we stripped the wallpaper off another room, primed and painted walls, hung quarter round over the kitchen cabinets, painted the trim and rolled seven doors and door frames, and hung a serious amount of art all over the house. What is it about getting art on the walls that makes it feel like YOUR HOUSE all of the sudden? We’ve almost reached the point where I won’t be embarrassed to host my sister’s engagement party (assuming everyone has enough champagne not to look at the trim too closely). One of my favorite events of the holidays is the whole family White Elephant gift exchange. We’ve honed the rules and routine over the course of a few decades and it’s quite the event. The stakes are high, and deciding what gifts to add every year comes with a lot of pressure- nobody wants to gift the dud. Thankfully this year I had a new cookbook published and (family spoiler ahead!) I’ll be including a copy in one of our gifts. This recipe from The Southern Cast Iron Cookbook will also have a place in our holiday extravaganza, most likely on the Thanksgiving table itself. 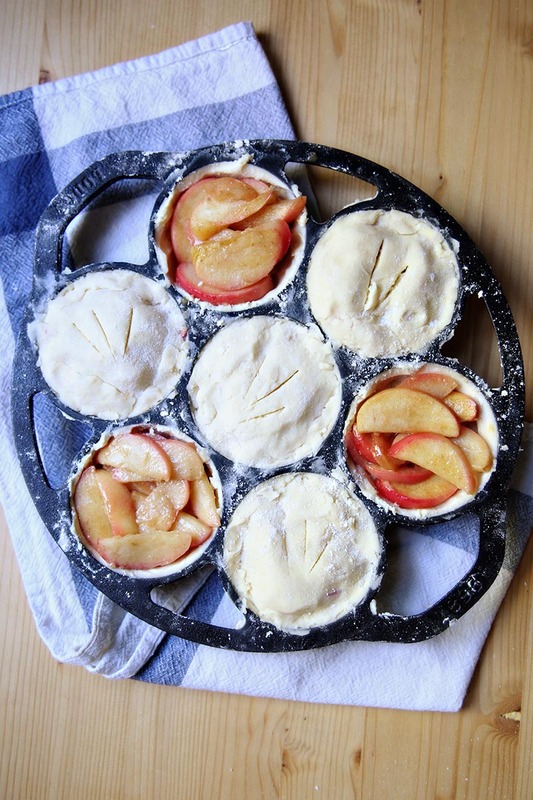 Apple pies with a little gouda grated into the crust, baked in a cast iron biscuit pan for the optimal crispy edges, are one of my favorite autumnal desserts. They’ll be the first dessert baked in my new kitchen, and I can’t think of a better occasion for its grand debut. In a food processor, combine the flour, Gouda, butter, sugar, and sea salt. Pulse until everything is crumbled and roughly resembles the texture of cornmeal. While pulsing, add the water 1 tablespoon at a time until a dough ball forms. Wrap the dough ball in plastic wrap and chill for 1 hour. In your skillet over medium heat, melt 2 tablespoons butter. 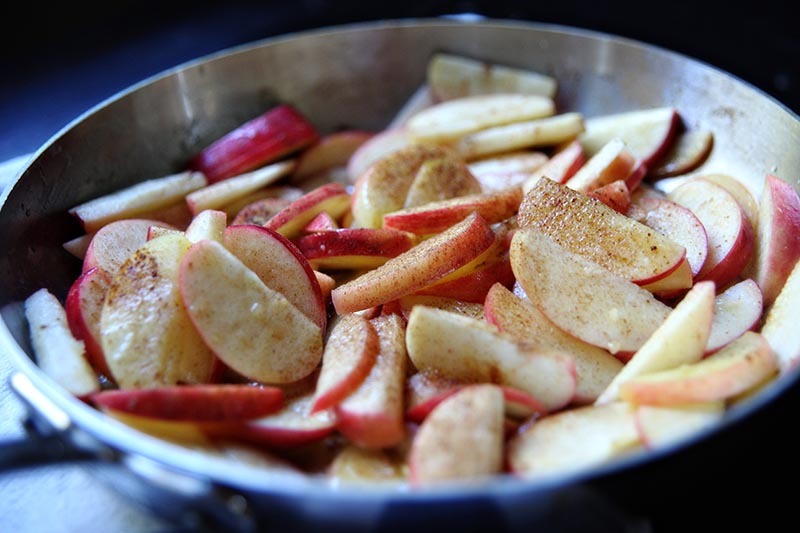 Stir the apples into the melted butter. Add the brown sugar, cinnamon, ginger, and vanilla. Cook for 15 minutes, stirring frequently. With the remaining 2 tablespoons butter, grease the wells of the biscuit pan. On a floured surface or a silicone baking mat, roll out 7 chunks of piecrust dough, each into a 5-inch circle about ¼ inch thick, and press 1 into each well. Fill each with equal amounts of the apples. Roll out the remaining dough ¼ inch thick and, with a circular piecrust dough cutter, cut out 7 (4-inch) rounds. Top each pie with one, joining the bottom crust with the top and pinching off any excess. 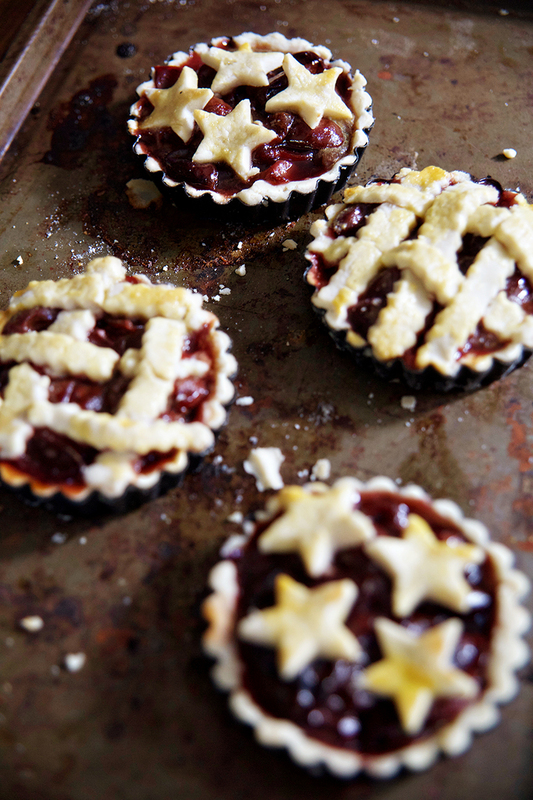 Cut 3 or 4 (1-inch) slits into each pie top. Brush the top of each pie with beaten egg. Bake for 35 to 40 minutes until browned and bubbling. Let cool for 5 to 10 minutes before gently removing the pies from the pan. Serve warm. Two weeks ago we moved into our new house. Ten days before that we closed, and the night before that we realized that 99% of the downstairs was not just painted bold colors, but painted bold colors on top of wallpaper. So the past three weeks have been a whirlwind of stripping wallpaper, scrubbing walls, priming (and priming and priming) and then painting like mad. We still have a few rooms to go and we still have a horrifying number of boxes to unpack, but I’m happy to say the house is starting to feel like our home. As you might expect, the kitchen was high priority. 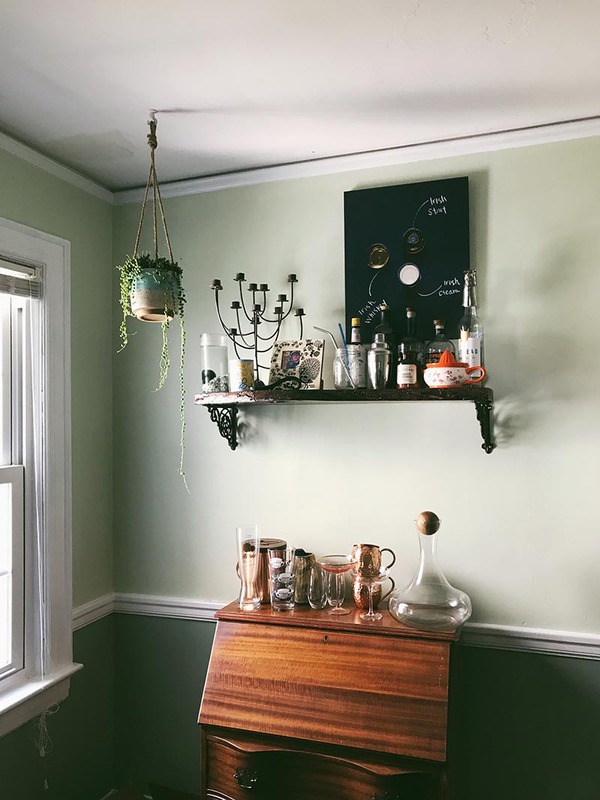 When we bought the house the walls were painted highlighter yellow on top of floral wallpaper and the cabinets were a medium wood tone. 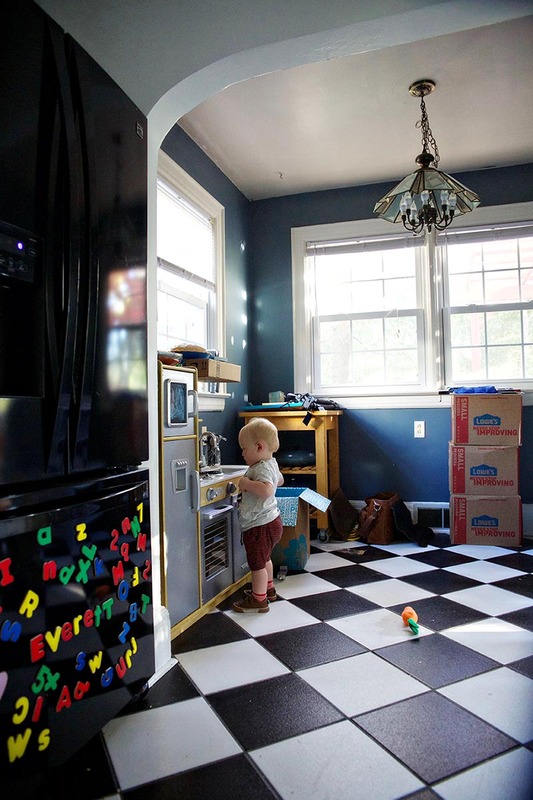 This didn’t work at all (in my opinion) with the black and white checkerboard floors, the dark gray (with flecks of red and some shimmer) counters, and the black appliances. 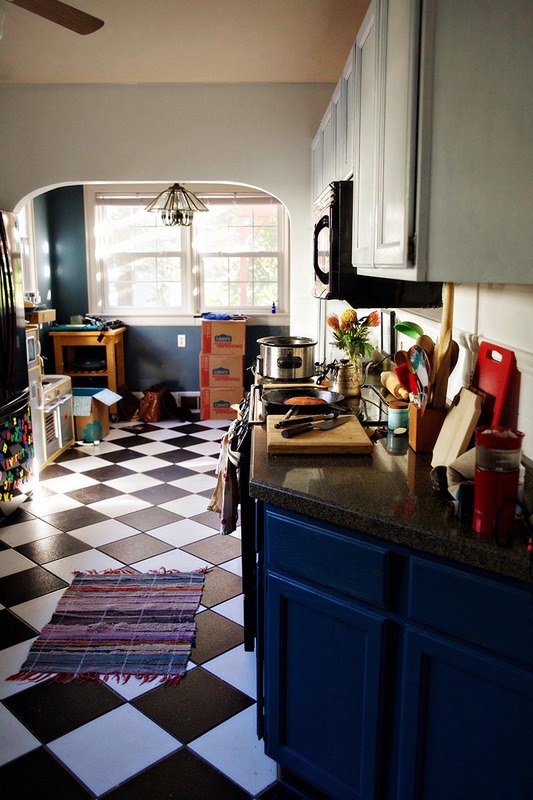 After much pinteresting with the center of my design being the floors, I settled on blue lower cabinets, light gray upper cabinets, and white walls. The adjoining room will be my studio, so we chose a darker blue/slate color that complimented but didn’t match the cabinets. It all came together with a lot of elbow grease and even though we know we have at least a few big projects ahead of us in here (backsplash?) we’ve started adding some details that make it feel like home. 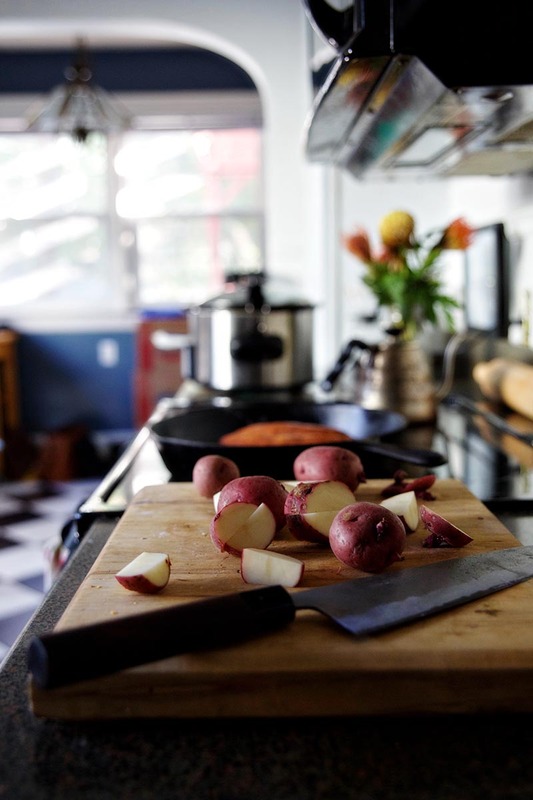 The first dinner we made in this house was a crock pot soup, appropriate for both the cold snap and the fact that when we moved in our oven didn’t have any racks and our stovetop was covered in painting supplies. 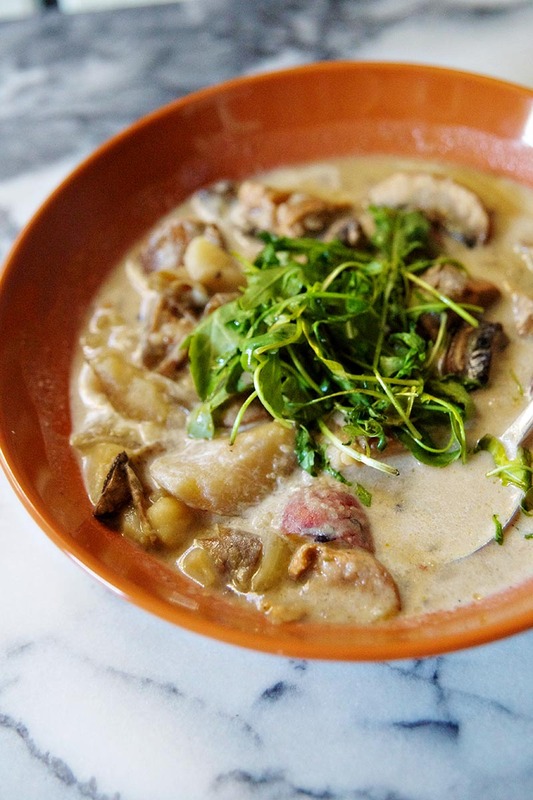 I had an abundance of red potatoes leftover from our camping trip to the mountains (which became a “camping” trip because of the hurricane forecast), so I made a simple potato, sausage, and mushroom soup that I topped with wilted arugula. Nothing fancy, but very good. 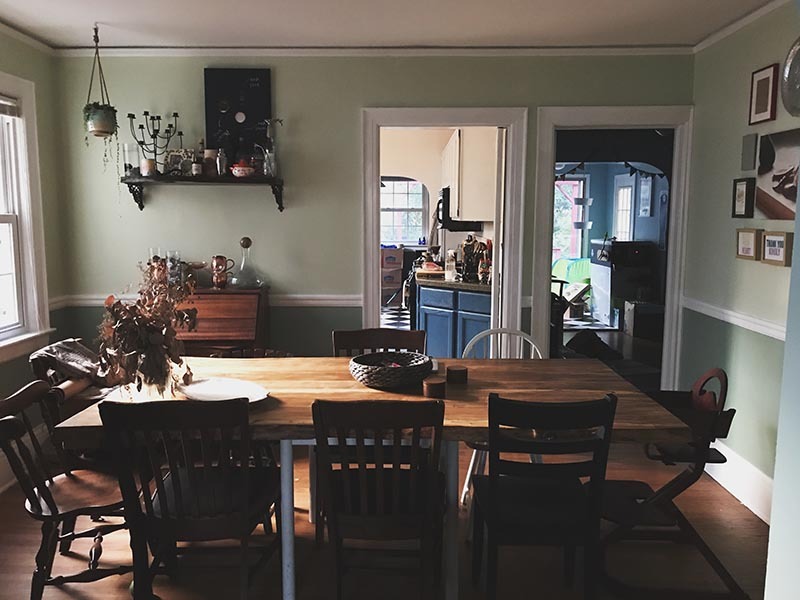 I know that over the years we’ll make countless meals in this kitchen, every day dinners and feasts and everything in between. I hope that this kitchen will be the center of our home, and that this house will be our home for decades to come. It feels really wonderful to be investing in something that could be ours for the long term, and it’s so much fun to dream up the possibilities. Quarter potatoes and combine in crock pot with stock. Chop onion and mince garlic and add to the pot, along with salt and red pepper flakes. 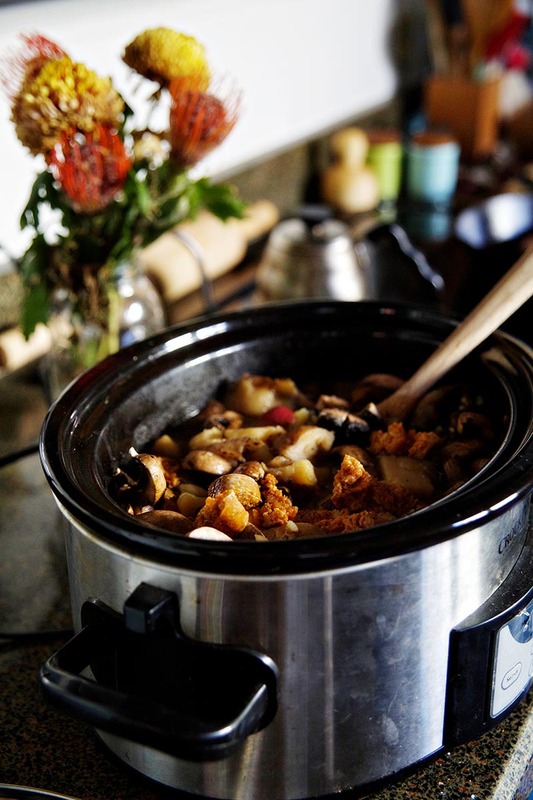 Turn the crock pot on low (6 hours) or high (4 hours) with the lid on. Stir occasionally. About an hour before you’re ready to serve the soup cook cook the sausage in a skillet until done, then slice and add to the crock pot. Slice the mushrooms and cook them in the drippings from the sausage until they are tender, 2-3 minutes. Add them to the crock pot along with the cream and lemon juice. Taste and adjust salt as needed. Allow to cook for another 30-45 minutes on high. Wilt arugula in a skillet with a drizzle of olive oil and plate each serving with arugula on top. I’ll admit that I am not a particular fan of wine made from muscadines (or, for that matter, scuppernongs). But just because I prefer a dry wine doesn’t mean the beauty of the muscadine, a grape with a long history in North Carolina, is lost on me. As it turns out, making sweet wine is just one of the many things a muscadine can do. First off, muscadines are lovely on their own, though you have to eat them in comfortable company because they require a fair amount of spitting- the seeds and the skin are not palatable raw. They also make the most wonderful jam. And simple syrup, perfect for cocktails. But above all else my favorite application of the muscadine is the hull pie. Seeded and simmered to soft perfection, a hull pie allows the tart and unique flavor of the grape to shine. I’m currently in the midst of packing my house (so that we can move approximately .5 miles away) which means my pie plates are somewhere in a box deep in my dining room. 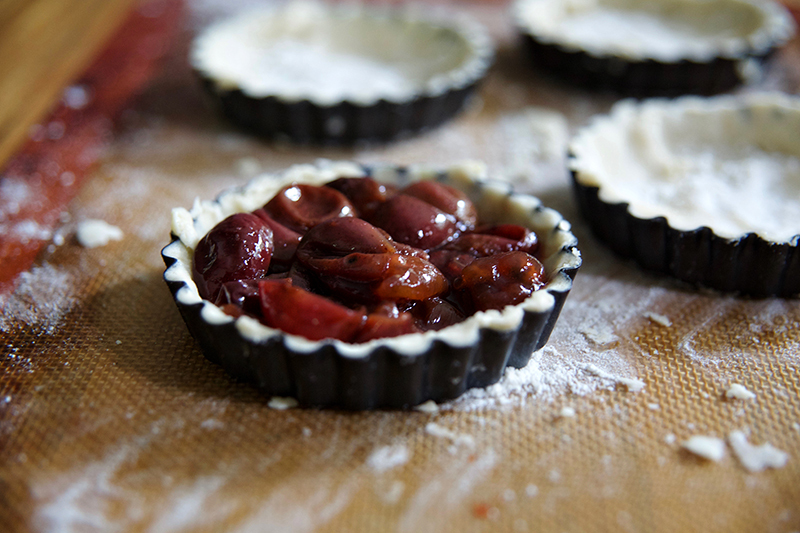 Easily accessible were my mini tart pans, which made a handful of the sweetest little muscadine tarts I’ve ever seen, perfect for topping with a scoop of vanilla ice cream and eating as I stared at a pile of empty boxes, waiting for me to get my second wind. 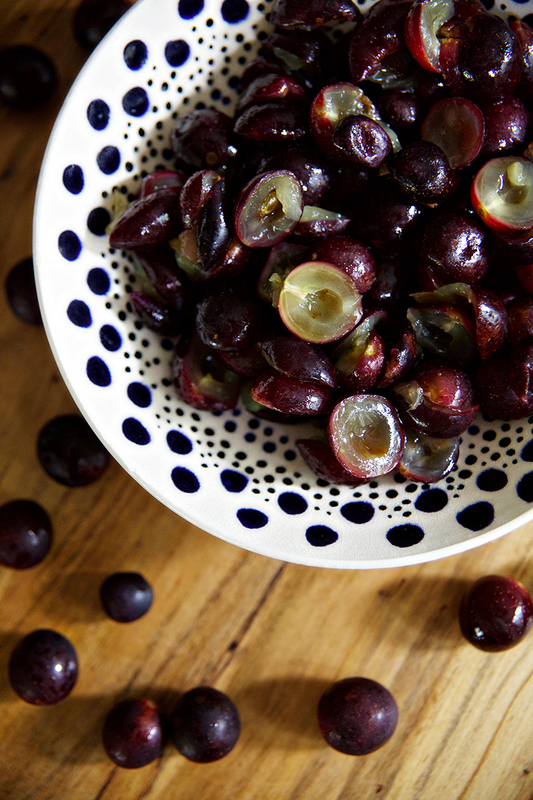 In a saucepan combine grapes, lemon juice, sugar, salt, and vanilla. Bring to a boil and then reduce to a simmer. Simmer for 45 minutes, stirring frequently. While your muscadines simmer combine flour, butter, salt, and sugar in a food processor. Pulse until the dough resembles cornmeal. Slowly add water, pulsing until a dough ball forms. Chill. Once your grapes have cooked down preheat your oven to 350F. 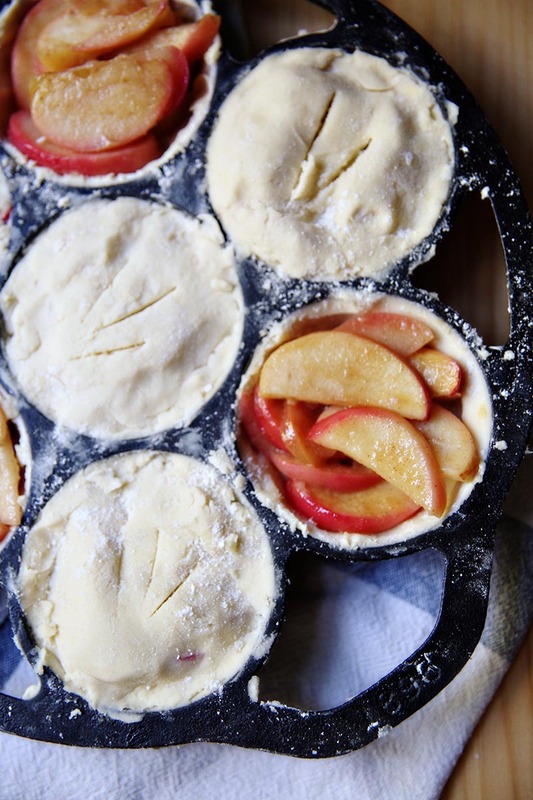 Roll your dough out on a floured surface and press into greased tart pans (or pie dish). 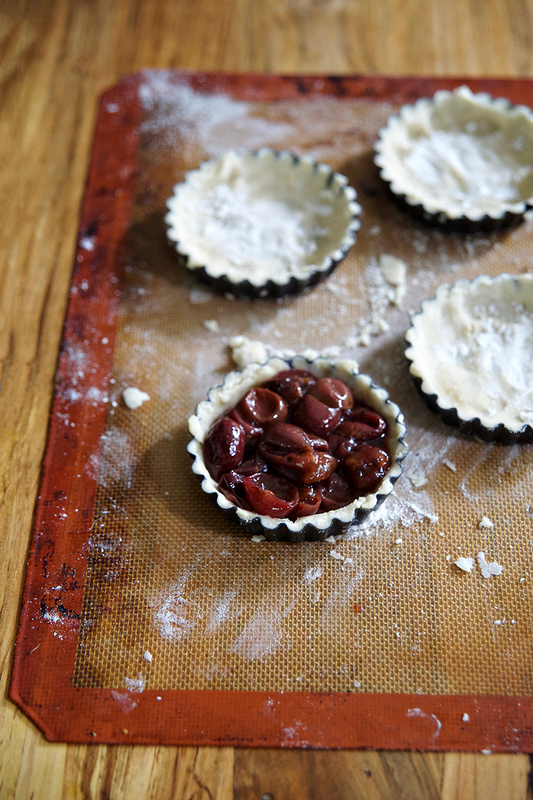 Fill each tart with filling. Roll out remaining dough and either cut strips for a lattice or cut shapes to decorate the top. Whisk egg and brush crust of each tart. Bake for 45 minutes or until browned and bubbling.